Tony Ferguson is no newbie in the peculiar mixed martial arts sports. The very skilled fighter has been punching jaws since 2008 when he made his debut. Ferguson is one of UFC’s finest fighters in the lightweight division and has recorded great wins under the platform. Tony Ferguson set a standard for his counterparts in the UFC Lightweight Championship in 2017, when he clinched 10 consecutive wins – the first ever to be reached in UFC’s lightweight division history. Many have wondered what the secret to his victory at the time really was, but Fergusons life on the ring clearly proves determination and hard work to be his secret. Here are lesser known facts about the UFC fighter. He was born Anthony Armand Ferguson Padilla on February 12, 1984, in Oxnard, California. He is of Mexican-American descent but got his surname from his stepfather who is of Scottish-American descent. Tony started from his high school days to show great inclination and mastery for wrestling. He was known for his profound skills in football, and baseball while at Muskegon Catholic Central High school in Michigan where he grew up. One of his remarkable wrestling records at the time was that he was a three-time All-State selection, and he also won the 152 lbs division. Tony proceeded to the Central Michigan University after high school, and also attended Grand Valley State University. However, his passion for wrestling overshadowed his will to face his education. Ferguson spent most of his college days participating in different bouts in school. His mixed martial arts career kicked off after college when he moved back to California. After moving to the city he worked first in marketing and sales and also had a side job at night as a bartender. It was during this period that he got an invitation from a patron to train young mixed martial artists. After accepting the offer, Tony was motivated to venture fully into the MMA field. He debuted in 2008 with small-scale bouts before joining The Ultimate Fighter reality series in 2010. He then competed as a welterweight in The Ultimate Fighter: Team Lesnar vs Team Dos Santos. Ferguson joined the Ultimate Fighting Championship (UFC) when he debuted at The Ultimate Fighter 13 Finale against Ramsey Nijem. He won his lightweight bout against Aaron Riley by TKO. He won the fight which was at The Ultimate Fighter 14 Finale against Yves Edwards. Ferguson who went on a one-year hiatus over an arm injury in 2012 returned in October 2013 and won his fight against Mike Rio at UFC 166. He continued to win more bouts in the UFC and made impressive records on the platform. He came out victorious in the main event at The Ultimate Fighter Latin America 3 where he fought against Rafael dos Anjos. As of 2018 Ferguson has lost only 3 games out of 23 and hopes to come out victorious in the fights to come. Tony Ferguson nicknamed ‘El Cucuy’ has attained a financial status worth coveting by his counterparts. For each of his wins, the renowned fighter pockets large sums of money from promotions. For winning the bout against Lee at UFC 216 for the interim UFC Lightweight Championship, Tony Ferguson pocketed a whopping $500,000 and also a sum of $250,000 as show purse. Ferguson who debuted in 2008 has watched his salary grow over the years. The UFC fighter earns over $450,000 per match and has his winning bonus estimated at $982,000. His net worth is estimated conservatively to be about $2 million. 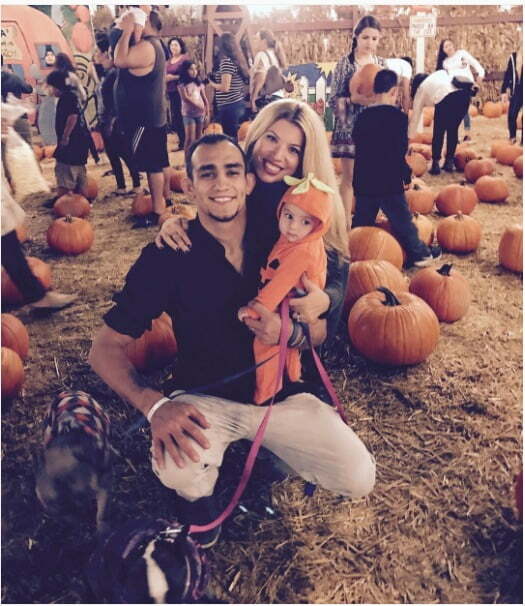 Tony Ferguson’s life may seem so occupied with his career engagements but the UFC fighter makes out time for his family and love life. He is married to Cristina Servin, his longtime girlfriend. Ferguson and Cristina had dated for a very long time before he popped the question in 2011. The couple finally tied the knot in June 2012 and have been together since then. In April 2016, Tony and his wife welcomed a baby boy, Armand Anthony. Tony Ferguson has a strong and sturdy body build which is quite soothing to his daunting career. He may not be the tallest but is quite known for his strong stamina. He stands at a height of 5ft 11in (1.80m), proportional to his weight of 70kg (154 lbs). He has a long reach of 76 1/2 inches (193 cm).